The position of soccer goalie necessitates playing the last line of defense for your team. 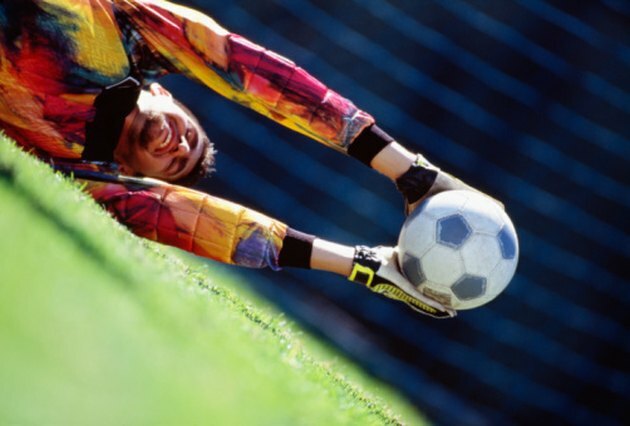 Playing goalie, or goalkeeper, requires leadership skills, confidence, perseverance and the ability to stay calm and cool-headed, even immediately after a mistake. The goalie position has its own set of regulations to follow since the goalie is the only player allowed to use hands and arms in contact with the ball; but the goalie may only travel so far. The goalie is the only player allowed to touch the ball with her hands and arms during play, but this special ability is limited to when she is inside the penalty box. The box extends out 18 yards from the end of the field and is 44 yards wide; the goalie may handle the ball anywhere inside this area. Outside the penalty box, the goalie is subjected to the same rules as any other player. The goalie is not allowed to pick up the ball or use his hands or arms if one of his teammates throws the ball to him without it making contact with an opponent before it reaches the goalie; this may occur during a throw-in. Also, the goalie may not use his hands if one of his own teammates intentionally kicks the ball back to him. If, however, a teammate passes you the ball by using his head, called "a header," you are again allowed to use your hands during play. Last, once the goalie drops the ball to the ground, it is considered in play and the goalie may not pick it back up, but must kick the ball away. The goalie is not required to remain inside the penalty box during the game, but leaving her post requires good judgment. The goal line, also called "the line" or "end line," runs across the front of the goal and marks where a ball must pass to qualify as a point scored. Goalies are encouraged to guard this area closely, but should come out deeper into the box the majority of the time. Leaving the box completely is only encouraged when play is focused at the other team's goal. When leaving the comfort of the line, you can use techniques that encourage more positive results. For instance, when coming into a group of your defenders you need to vocalize your intention to grab the ball so you don't get tangled up with your own team. Yell, "keeper!" and teammates will back off. When diving, always land on your side. Do not cover the entire box alone, either; allow other defenders to assist. Also, when you take possession of the ball, you have six seconds to get it back into play. Last, be confident: Once you decide to go, stick with your choice. History of Soccer: Want to Know About the Soccer Positions on a Team?